The Central Bank of Nigeria (CBN) has found reasons to apologize over misleading information it published in advertorials of “non-performing debtors” said to owe billions in unpaid loans to the five banks whose CEOs were sacked last Friday. But this time, the managements of Dangote Industries Ltd, Oando Plc, Rockson Engineering Ltd and Global Fleet Oil and Gas Ltd are saying the CBN and its Governor, Mallam Sanusi Lamido Sanusi should be held in contempt and have threatened court action should the apex bank retract the misleading publication and apologize. In a press release by the CBN Corporate Affairs Division and posted on its website, the CBN admitted that the published list alleging loan repayment delinquency was compiled from reports from the affected banks as at May 31, 2009, which was a cut-off date for the special examination in the first 10 banks. “The general public and all concerned should note that the list published is as at 31st May, 2009 and if any of the defaulters/debtors have made any repayments after that date, they should sort it out with the relevant bank,” the release noted. Although the CBN said it regretted any inconvenience caused as a result of the typographical errors mentioned, it nonetheless, said the list of other debtors/defaulters was being compiled and would be published on an ongoing basis. Meanwhile, the management of Dangote Industries Ltd has sent a strongly worded missive to the CBN Governor demanding the immediate removal of the name of Alhaji Aliko Dangote from the list of non-performing debtors of Intercontinental Bank Plc. The group, in a statement, insisted that contrary to what was erroneously published in the CBN advertorial, Alhaji Aliko Dangote was neither a director nor a shareholder of Dansa Oil and Gas Ltd. The statement noted that Aliko Dangote is not the same as Ali Dangote; the latter being the son of Alhaji Sani Dangote. In a related development, the management of Oando Plc, in a rejoinder to the CBN advertorial stated that there was no way its relationship with Oceanic Bank could be deemed non-performing and demanded the CBN and Oceanic Bank to correct the erroneous impression in the report. The advertorial had stated that Oando Plc had total non-performing loan facility of N7.1 billion with Oceanic Bank Plc and constitutes one of the big debtors in the bank. But Oando management said in a statement that as part of its ongoing relationship with Oceanic Bank, it had different credit balances on its deposit account and other debit balances on its advised loans as at May 31, 2009, adding that none of the debit balances represented “a past due obligation”. In yet another development, Jimoh Ibrahim, the Group Managing Director of Global Fleet, pointed out in a statement that he and four companies in which he has interests - Global Fleet Oil and Gas Ltd., Global Fleet Industries, Fleet Hotels and NICON Group - owe Oceanic Bank N8 billion and not N14.7 billion as inaccurately stated in the CBN advertorial. Also, the Managing Director, Rockson Engineering Ltd, Sir Arumemi Johnson- Ikhide, and its Chairman, Senator Aniette Okon, also described as false the publication by the CBN that their company's indebtedness to Intercontinental Bank Plc stood at N36, 989,685,692.84.They insisted that the company's indebtedness to the bank was N14, 423,291,589. 49. Okon said the company would write to the CBN for the retraction of the publication. In fact, in what amounted to a slap on the face of the CBN Governor, the new management of Intercontinental Bank Plc led by Joseph Ajewole disavowed the CBN, declaring that the N16 billion loan granted United Alliance Company of Nigeria Ltd, in which the Managing Director of Access Bank Plc, Aig-Imoukhuede and his deputy have interest, was performing, contrary to the CBN advertorial which classified the credit as non- performing. Intercontinental Bank in a letter addressed to the CEO of United Alliance, Chizoba Ufoeze, absolved United and the two Access Bank chiefs of involvement in the huge non-performing loans of Intercontinental, which the CBN put at about N211 billion - representing 28% of the bad loans of the five troubled banks. Debtors owing the five troubled banks seem to have no breathing space any longer as the Economic and Financial Crimes Commission (EFCC) has given them a seven-day ultimatum to pay their debts worth N747 billion from the affected banks or face arrest, prosecution and possible seizure of their assets. On the list of directors of such companies are prominent businessmen, top bankers, politicians and other important dignitaries. A breakdown of the non-performing loans is as follows: Oceanic Bank Plc, N278.204 billion or 37%; Intercontinental Bank Plc, N210 .903 billion or 28%; Afribank Nigeria Plc, N141.856 billion or 19%; Union Bank of Nigeria Plc, N73.582 billion or 9.8% and FinBank Plc, N42.445 billion or 5.6%. The two biggest debtors to Intercontinental Bank are Ascot Offshore Nigeria Limited through which Henry Imasekha along with three others secured N44.67 billion and Rockson Engineering Limited through which Engineer J.1. Arumemi-Ikhide and his wife secured N36.989 billion. Oceanic Bank on the other hand, has Notore Chemical Industries Limited, which borrowed N32.392 billion and Rahamaniyya Global Resources through which Abdul Rahaman Musa Bashir rumored to be engaged to Aisha –the President's 4th daughter - got N28.598 billion. Afribank has Kolvey Company Limited, which borrowed N16.5 billion and Rehoboth Assets Limited through which five of the Ajaegbu families got N28.598 billion. The two key debtors to FinBank are Aquitane Oil and Gas which borrowed N3.656 billion and Falcon Securities through which it's Managing Director, Peter Ololo, currently in the EFCC dragnet in Abuja secured N3.49 billion. The two principal debtors to Union Bank are Transnational Corp Plc, in which the Director-General of the Nigerian Stock Exchange (NSE), Dr. Ndi Okereke-Onyiuke, is a director/ major shareholder, which borrowed N30.863 billion on behalf of the company and MTS First Wireless Ltd through which Chief Lulu Briggs secured N9.849 billion. The Board of the NSE Commission rose from its 43rd meeting Wednesday, directing that the affected Executives of the five (5) banks who are members of the NSE Council be suspended immediately pending the conclusion of investigation of allegations against them by the CBN. Also affected was the former Managing Director of Intercontinental Bank Plc, Dr. Erastus Akingbola, who was granted leave by a Federal High Court in Lagos to challenge his forceful removal from office by the CBN Governor. Akingbola was NSE 1st Vice-president and assistant to Aliko Dangote. To the extent that the CBN debtors lists have become a naming and shaming campaign and a public embarrassment for those involved, it is incumbent on the CBN to tread carefully as it proceeds to sanitize the banking sector. 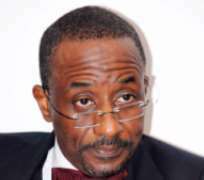 Huhuonline.com will want to give Lamido Sanusi the benefit of doubt, but the CBN should, as a matter of principle, specifically retract and correct the misimpressions, which were neither stated nor intended in its debtor's list advertorials.